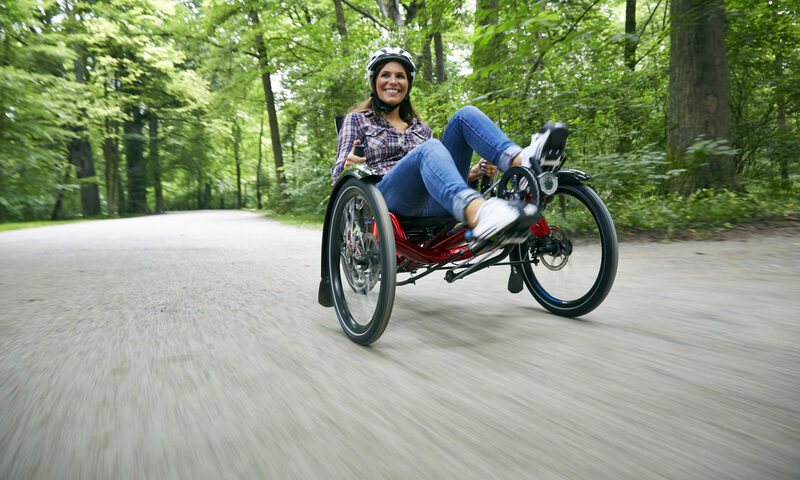 I had my first test ride a few years ago at the IFMA show in Cologne – I borrowed a Scorpion prototype for an hour 😉 First impressions were how light it is for a trike – the aluminium frame and BodyLink seat definitely help with that, even with the back suspension. It’s also much easier to get onto than other tadpoles because of the swept-forward crossbeam – as an experiment, I tried getting on without using my hands, and it’s not hard. On the shiny indoor tarmac of the test track, cornering was superb – leaning into the corners and really pushing it, all three wheels scrub equally in corners – the weight distribution is perfect. For a tadpole, the turning circle is very good – unlike on lots of tadpoles, the handlebars miss the wheels completely – safer, and it means that the wheels can turn a lot farther. Speaking of the wheels, they’re all very quick to remove – the back one is a standard quick-release of course, and a very clever allen key fitting lets you take the front wheels off in seconds without touching the disc brakes. Certainly quick enough to help pack the bike away, or fix a puncture more easily. Unusually for a trike, the Scorpion can easily do double duty as a serious touring bike or a fast race bike. The back suspension and rear carrier make it very comfortable and mean that you can carry two large panniers or HPVelotechnik’s own recumbent panniers – but the Bodylink seat is reclined and supportive enough for fast powerful riding, and with slick tyres and lighter components it’s a very fast and fun trike. Disc braking: Twin front discs are extremely powerful, and I couldn’t detect any brake steer at all – it also doesn’t nosedive even under very hard braking. Normally each front brake has it’s own lever, and a gearshift lever operates the rear parking brake if one is fitted, but you can have paired brakes instead where both front brakes are operated from one lever. Rear suspension: The Scorpion’s suspension is the same design as on HPVelotechnik’s other bikes – a swingarm which doesn’t bob under pedalling, and soaks up the bumps and vibration – very important on a trike where you can usually steer the front wheels around obstacles. The fs model also has front suspension. BodyLink seat: HPVelotechnik’s own design, and now used on most of their bikes, the BodyLink seat is very adjustable. Top and bottom halves move independently, so you can adjust the length, angle and curve of the seat. Also shown: the optional headrest and Airflow cushion. Or you can have the tubular-framed Ergomesh seat, possibly comfier but not so sporty.